Spec E46 is now officially a NASA-sanctioned class for 2015. Competitors now will be eligible to compete in the Spec E46 class in all regions. Designed with BMW enthusiasts in mind, Spec E46 provides a newer platform from which to start, focusing on affordability and still maximizing fun per dollar. With more than 50 Spec E46 cars already built or underway, NASA expects a great turnout in Spec E46 fields in 2015 and beyond. Jason Tower has been named National Series Director and Evan Levine as the Assistant National Series Director. 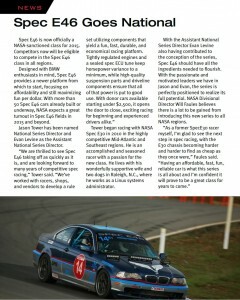 Tower began racing with NASA Spec E30 in 2010 in the highly competitive Mid-Atlantic and Southeast regions. He is an accomplished and seasoned racer with a passion for the new class. He lives with his wonderfully supportive wife and two dogs in Raleigh, N.C., where he works as a Linux systems administrator. With the Assistant National Series Director Evan Levine also having contributed to the conception of the series, Spec E46 should have all the ingredients needed to flourish. With the passionate and motivated leaders we have in Jason and Evan, the series is perfectly positioned to realize its full potential. NASA Divisional Director Will Faules believes there is a lot to be gained from introducing this new series to all NASA regions.